For those of you that love fine chocolate, I have the pleasure of presenting a guest post from the award winning Highland Chocolatier. Founder and director Iain Burnett is on the board of the Academy of Chocolate and so only uses ethical and fairly traded chocolate in his creations. As you’d expect from the name, the Highland Chocolatier is based in Scotland at Grandtully, Perthshire. You can visit in person of course, but for those of us who can’t quite make it, the chocolates are also available online. I am very much looking forward to trying some of them. Gourmet Chocolate brand, Highland Chocolatier have taken the chocolate world by storm and have been awarded the “Best Dark Truffle” in the world in October 2015 at the International Chocolate Awards. Iain Burnett’s “Velvet Truffle” award winning range is world famous and is made and sold in the heart of Scotland. Famous for his use of natural ingredients and ethical products, the chocolatier’s kitchen is situated next to the Scottish Chocolate Centre. The brand is known for its smooth vegetarian and vegan options that can be bought online or at their kitchen which has been so successful that it is now a four-star attraction for locals and visitors who travel far to enjoy the coffee house, gift showrooms, gourmet chocolate shop and tours of the centre. All of Iain Burnett’s chocolates are crafted at their main base at Grandtully in Highland Perthshire. The work for the Velvet Truffle award winning recipe began over a decade ago and it is now Scotland’s most awarded chocolate. Iain Burnett’s secret to success is using natural ingredients in his chocolates. When he speaks of his award winning range he says: “Many years of work has gone into the Velvet Truffles so it’s fantastic that such a pure ganache – just rare cocoa and a very particular fresh cream without additives – is recognised by pastry chefs, restaurateurs and members of the international Grand Jury”. It is this skill that went into the creation of Queen Elizabeth’s 90th Birthday celebratory chocolate: The Sandringham Truffle. 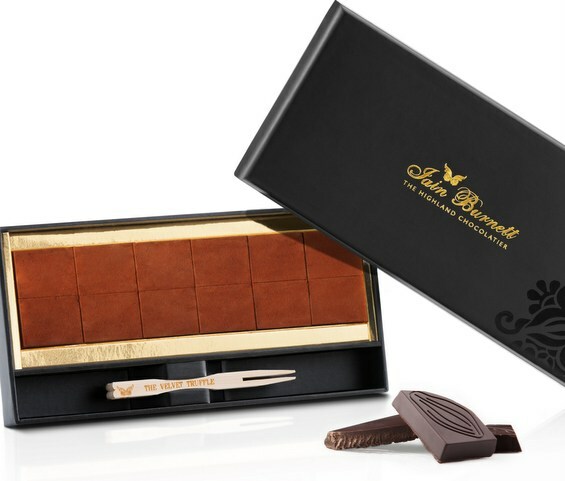 Iain Burnett was chosen to create a gourmet chocolate that was literally fit for a queen! Released this summer, The Sandringham Truffle was crafted with ingredients sourced from every corner of the UK. The butter was sourced from Dale Farms in Northern Ireland, the delicious flavour of wildflower honey from Hilltop Farm in Wales, Scottish fresh cream from Iain Burnett’s dedicated herd of Friesians in Perthshire and of course the fragrant blackcurrants from the Queen’s very own garden in Sandringham, England. Iain Burnett’s vegan collection does not stray from his delicious gourmet chocolate range and in fact it may even be better tasting. If you are looking for a vegan chocolate selection, then look no further than Ian Burnett’s online store. Here you will find treasure chest of delicious dark chocolate that was made to simply melt in your mouth. Highland Chocolatier have a range of vegan options that are perfect for gifts or self-indulgence. Iain Burnett’s professional chocolate chefs use only natural ingredients making it one of the purest forms of chocolate you can source in the UK. With chocolate as pure as Highland Chocolatier’s Sao Tome blend, it could make a difference to your taste buds and health! Dark chocolate is a wonderful choice if you want to increase the flexibility of your arteries and reduce white blood cells sticking to the walls of blood vessels! Highland Chocolatier’s 70% dark gourmet chocolate is sourced from the volcanic island of Sao Tome. Each bar, when enjoyed in moderation, will be just the right amount of cocoa you need to receive the health benefits from delicious chocolate. Each one of Highland Chocolatier’s dark chocolate bars is vegan and would be a perfect chocolate gift for a loved one with specialist dietary requirements. “Exceptional flavour and texture” is Highland Chocolatier’s priority however the brand also sources ethical ingredients. Iain Burnett is on the board of “The Academy of Chocolate” therefore Highland Chocolatier only uses fairly traded cocoa and has been scrupulous to ensure that his source of chocolate is indeed fairly traded. The vegan dipped fruit selection comes in three gourmet chocolate options: classic, tropical and clementine. This gourmet assortment of succulent fruit is gently candied in syrup for over a week which helps the sweets to preserve natural flavours. Each piece of fruit is dipped in 70% dark São Tomé chocolate and one lemon slice dipped in delicious blonde chocolate. This is also a perfect option for chocolate lovers with a nut allergy. Iain Burnett have a great range of vegetarian and vegan products at a variety of prices. The unique things about this brand is that the chocolate which is created at their Scottish chocolatier is pure and natural. Iain Burnett will be releasing more products in the run up to Christmas and we can’t wait to see what’s coming next! This is a sponsored post and apart from the top paragraph, not written by me. However, I only feature content that I’m interested in and hopefully my readers will like too. Oh these chocolates look amazing!! I adore dark chocolate. It wasn’t until I started this blog that I really got into dark chocolate. It’s wonderful stuff. Natural ingredients and ethical products – sounds like my kind of chocolate! The different flavours sound so delicious! Chocolate is the one food I never want to live without, especially dark chocolate! I have at least one square everyday on most days. It would be a hard world indeed without chocolate Nadia. The great thing about good quality chocolate is that a little bit goes a long way. These chocolates sound so special. They’re made with so much love and care for the ingredients. How wonderful. I just wish all chocolate was made with such love and care. Things are definitely getting better though. they really do look beautiful and not too lah-te-dah if you know what I mean…. really need chocolate now. Great review! I am loving dark chocolate with mint at the moment, so i will have to try some of these. Maybe it’s the time of year. I’m really into mint chocolate too at the moment. These chocolates look stunning! I’d love a box of these truffles. YUM. Yes, there’s nothing quite like a box of really good quality chocolates you can feel good about. I would love to try these!!! I am always up for some chocolate!! What amazing chocolates! It was so interesting reading about all the care and skill that go into making his chocolate creations. Clearly his reputation is well earned. Thanks Annemarie. I think it’s quite hard getting to the top in the chocolate world, so he’s obviously done well. I love the sound of almond and pistachio I love nutty chocolates. Yes me too Nayna and pistachio really is extra special. Very true Salwa. Luckily things seem to be getting easier for vegans all the time.